—Grant, Peter. Dain spioradail. Elgin : Peter Macdonald, bookseller, 1837. New College Library Gaelic Collections 250. Did you know that over 400 items which together form the Gaelic Collections at New College Library have recently been catalogued online? Come and join me at the Pop-up Library (on the first floor of the Main Library) on Wednesday 22 October, 10-12 pm, to find out more. 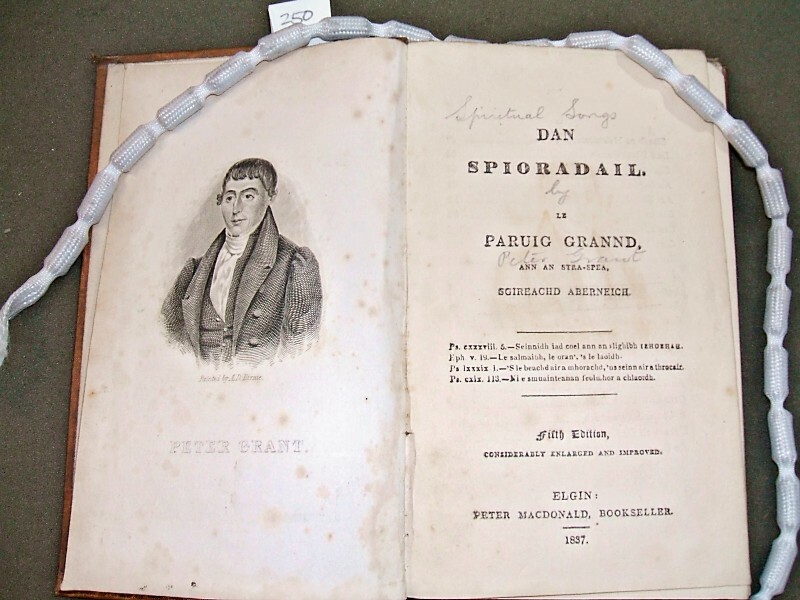 The Gaelic Collection contains several editions of “Dain spioradail ” by the celebrated hymn writer Peter Grant, and this edition at Gaelic Coll. 250 is the fifth edition, considerably enlarged and improved from earlier editions. It was published in Elgin, in the highlands of Scotland. The title page information refers to Grant’s Gaelic name Pàdraig Grannd nan Òran, which means ‘Peter Grant of the songs’. Grant was a Baptist minister, born on 30 January 1783 at Ballintua, Strathspey, Scotland. He was a skilled fiddle player, who was able to set his poems on evangelical themes to well known tunes which were popular into the twentieth century. This work is typical of the works in the Gaelic Collection, which contains many volumes of religious poetry. The Gaelic Collection was put together from various sources, including a substantial donation from the bequest of the Rev. Roderick Macleod. This entry was posted in Pop-up Library and tagged Gaelic, New College Library, Rare books, Special Collections by cloverodgers. Bookmark the permalink.